Whether you’re preparing to move into a new office, or you’re preparing your loft for a conversion, the necessity for rubbish removal is almost inevitable. 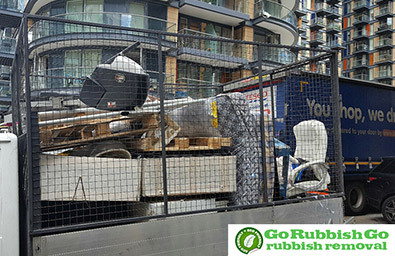 Go Rubbish Go has a team of house clearance professionals, offering a Belsize Park waste disposal service of standards that won’t be beaten elsewhere in the NW2 and NW3 areas. We provide services for almost any circumstance; ranging from home clearance to office clearance. Whatever you need disposing of in the NW6 district, our skills and expertise have got it covered. As a team of professionals, one of our key qualities that set us apart from the rest is our time management. We work on a tight schedule to ensure that we are punctual and that our efficient methods allow us to complete your NW3 waste removal quickly and at a high standard. When you hire us, you won’t need to worry about a single second of your day being wasted. We understand that not everybody is able to lift heavy items, so our able bodied staff are fully trained to carry and manoeuvre even the heaviest equipment without risk of injury. If you’re in need of a Belsize Park NW3 rubbish clearance service and you’d like to hear more about us, call 020 8610 9182 today. 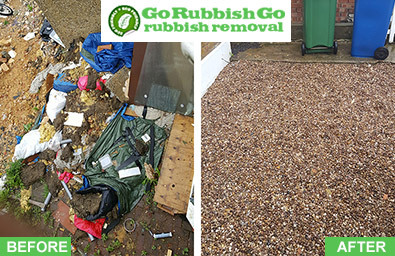 As a house clearance company in the NW3 region, here at Go Rubbish Go we are conscious of our effects on the environment. We work hard to find methods that enable us to minimise harm to the environment through waste, wherever possible. Our first point of call is recycling. When we collect your old junk for disposal in NW6, our intention is always to find somewhere it can be reused and anything we do have to dispose of is done so with respect to the waste clearance Belsize Park NW3 regulations that are in set place. Besides being eco friendly, we also try our very best to remain on good terms with your bank balance. We try our very best to keep prices low for our customers in any way we can. Great value for money! The waste disposal service I got in Belsize Park, NW3 was amazing. I hired this company to dispose of a few appliances and pieces of furniture that I no longer needed. The team were very polite and considerate. They asked me several times if I needed help with anything else. The items were sent for recycling which really impressed me. Ten out of ten! We Will Make An Easy Job Of Your Waste Removal In Belsize Park! Our clearance service is a much cheaper alternative to skip hire, and there’s absolutely no need for a skip permit. We charge you only for what we take, so there’s no need to worry about a fixed fee or being charged extortionate amounts for only a small clearance. Our main aim as a company is to provide high standards and pair them with low costs. If you’re interested in saving money, and need your property in Belsize Park cleared efficiently, call us today on 020 8610 9182 for your free quote on rubbish disposal NW3! Choose us today if you need good quality and efficient NW3 Belsize Park waste collection services. You don’t have to earn a fortune to be able to afford our waste removal services. They are accessible and more than affordable to all of our clients, so you don’t need to worry about money issues. We are confident that you will be happy with our services. They are more than affordable to all. Remember that, if you need your old mattress, your old furniture, old pain getting rid of, we can do all that and we can do it all efficiently for you. There is no doubt about it, when you hire us, you will be over the moon with our services and with our staff too. 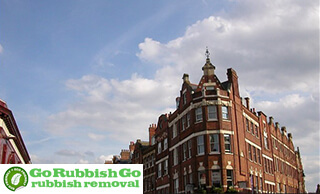 Our NW3 rubbish removal Belsize Park service is fantastic at bargain price! So if you need help of any kind, just turn to us by calling us now on 020 8610 9182 to find out more. You will get a free quote today. So check us out by calling us right away. You can trust us with anything you need at all. You are bound to be impressed. Belsize Park is an area in the north west of London in the borough of Camden. The region is a hit with lawyers and actors, of which many are residents. An attraction of Belsize Park is England’s Lane. It is lined with flower stalls, butchers and a variety of coffee shops and cafes such as Ginger and White’s and Camomile – the perfect place to stop and take in the views. Also nearby is the beautiful Primrose Hill Park, where locals as well as visitors can go for long walks and picnics in the beautiful surroundings. As far as entertainment is concerned, Belsize Park is fairly well equipped with bars and pubs. Apart from all these, the area has an Everyman Cinema, the perfect venue for a relaxed evening with a good film and drinks from the bar.